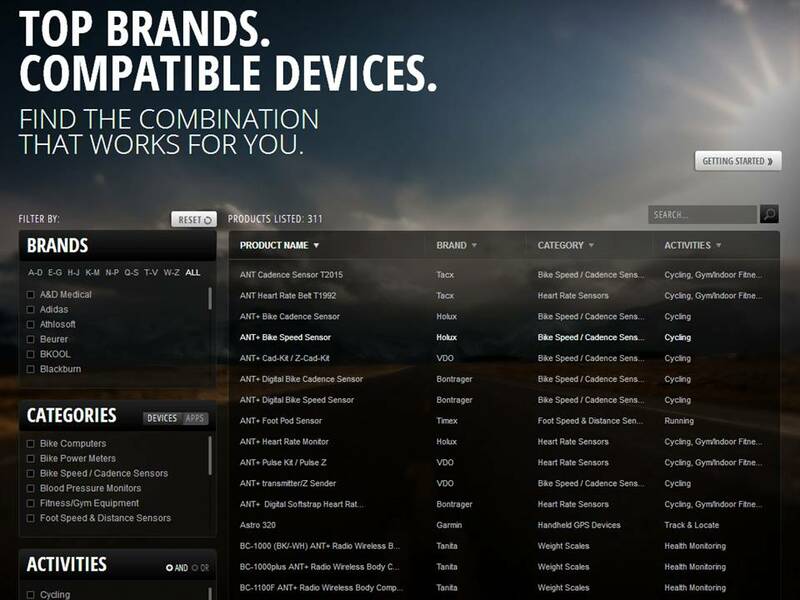 Top Brands Deliver World Leading Devices. ANT+ is the wireless technology that allows your monitoring devices to talk to each other. Leading brands design ANT+ into top products to ensure that you get the data you want - when and where you want it. Fundamentally, ANT+ gives you the simplest, most expandable and most reliable user experience possible. ANT+ stands for interoperability which means that ANT+ products from multiple brands work together. Plus, because devices are compatible, you can always add to or update your monitoring system. ANT+ activity icons represent the information that the product is capable of transferring. Sensors and displays with matching activity icons will work together. For example, an ANT+ heart rate strap will send heart rate data to a watch, phone, bike computer, tablet, and/or any other device that reads ANT+ heart rate. Mix multiple displays with multiple sensors all at the same time! For example, an enabled bike computer can read data from a power meter, speed/cadence sensor and heart rate sensor at the same time. Or have multiple displays read the same sensors at once. For example, both your watch and mobile app can read data from your sensors at the same time, allowing you to conveniently view live feedback on your watch while you work out, and track and analyze your workout with your app later. With ANT+ the possibilities are endless! Learn more about ANT+ activity icons and the data capabilities they represent. Featuring products from ANT+ partners, this tool does the matching for you. All of the products listed in this directory have been certified by our engineers or verified by the manufacturers as compatible with the designated activities.